This Toasted Marshmallow Fruity Pebbles Milkshake is loaded with creamy vanilla ice cream, a swirl of cereal, and topped with toasted marshmallows. 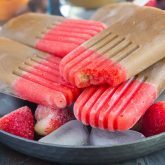 With just four ingredients and hardly any prep time, you can indulge in this delicious frozen treat to beat the summer heat! Fruity Pebbles is my favorite cereal. Hands down. No questions asked. Yep, my ten-year-old self often wins over the adult in me. Occasionally, I buy a more sophisticated (err, boring) brand of cereal, but for the most part, I love Fruity Pebbles. It was my favorite when I was a child and it still is today. And speaking of Fruity Pebbles, does anyone remember those Flintstones vitamins? I used to take the chewable kind was I was little, and it was a daily routine. My dad would give me a vitamin every morning, and I always hoped to get Dino. Nowadays, I take grown-up vitamins, but my tastes in cereal are still the same. And that’s a good thing, right? 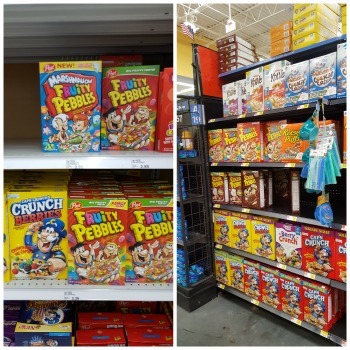 When I was shopping at Walmart last week, I came across Marshmallow Fruity Pebbles. And, I have to admit, I almost squealed with excitement. My favorite cereal, now with little marshmallows? It’s like it was made for me. 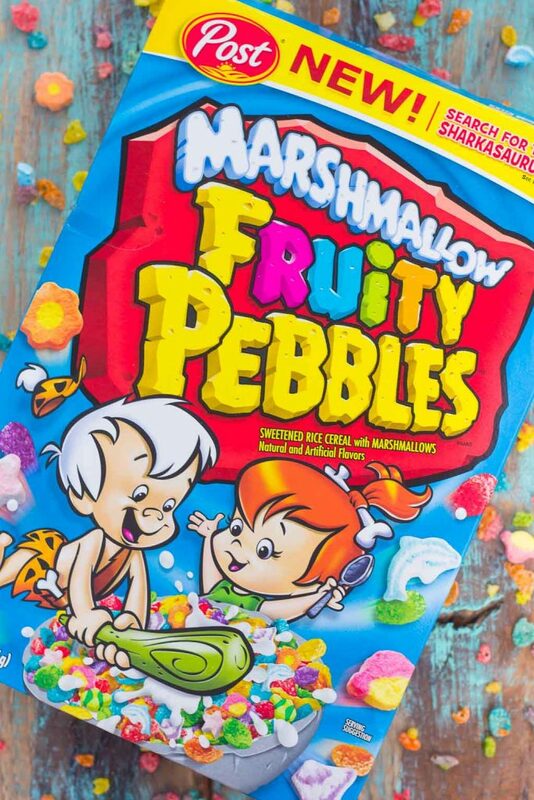 Fruity Pebbles has been a family favorite since 1970, and now, it’s even better with marshmallows! It has zero grams of trans fat per serving, is a low fat food, and is naturally cholesterol free. It also has a good source of Vitamin A, along with a variety of other nutritional aspects. So, you can feel good about indulging in Marshmallow Fruity Pebbles! But, Marshmallow Fruity Pebbles aren’t just for breakfast! If you’ve been hanging around here long enough, you know that I love taking a classic recipe and giving it my own, unique twist. Take these Fruity Pebble Donuts, for example. 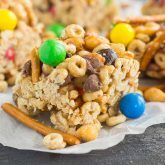 I turned my favorite cereal into a decadent, baked good. See, I told you that Marshmallow Fruity Pebbles aren’t just for breakfast! This milkshake is loaded with flavor, easy to make, and tastes so good. Plus, you can feel like a kid again with your favorite cereal, in drinkable form. Sounds pretty good, right? And like most of my recipes, this Toasted Marshmallow Fruity Pebble Milkshake is a breeze to whip up. Simply combine some vanilla ice cream, milk, a touch of vanilla extract, and Marshmallow Fruity Pebbles into a blender. Blend until it reaches your desired consistency and then pour into a tall glass. Top with a few marshmallows and use a kitchen blowtorch to lightly toast the tops. You’re just a few minutes away from sipping on this creamy, fruity and sweet milkshake. The burst of Marshmallow Fruity Pebbles and the sweet ice cream makes a delicious duo when combined with toasted marshmallows. 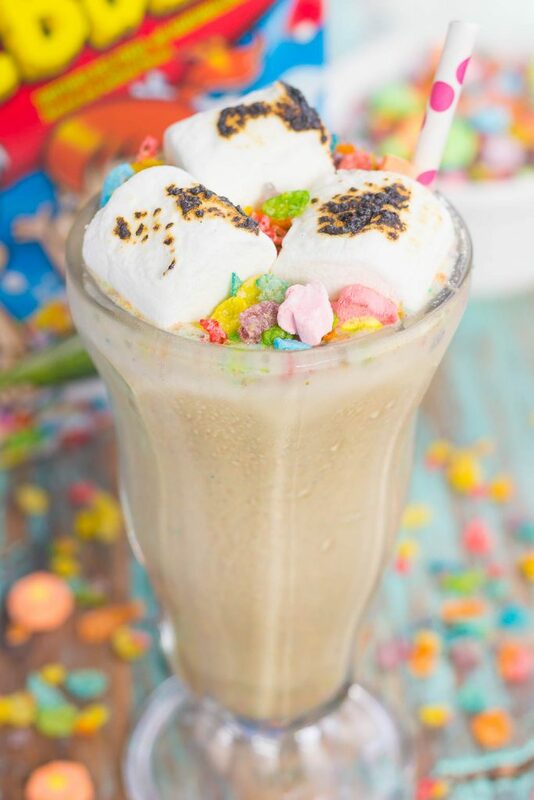 So, break out that blender, grab a box of Marshmallow Fruity Pebbles and whip up this fun Toasted Marshmallow Fruity Pebble Milkshake. The kid inside of you will be delighted! 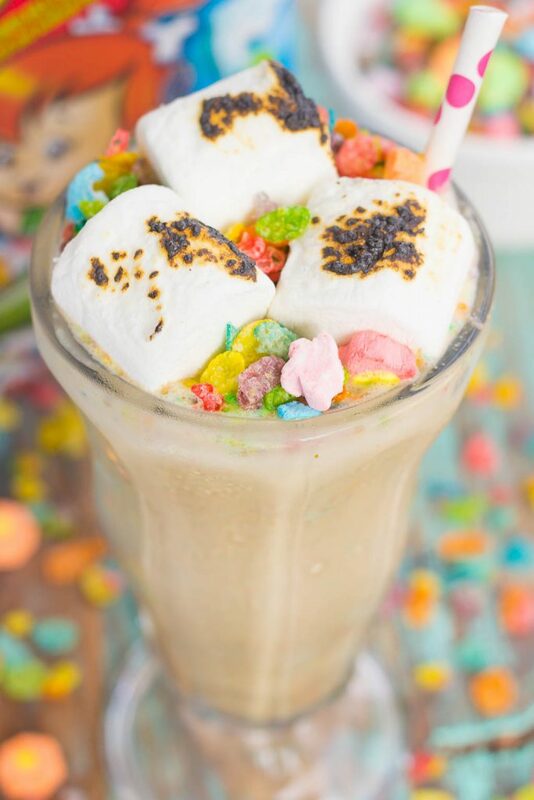 This Toasted Marshmallow Fruity Pebble Milkshake is loaded with creamy vanilla ice cream, a swirl of cereal, and topped with toasted marshmallows. 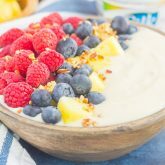 With just four ingredients and hardly any prep time, you can indulge in this delicious frozen treat to beat the summer heat! 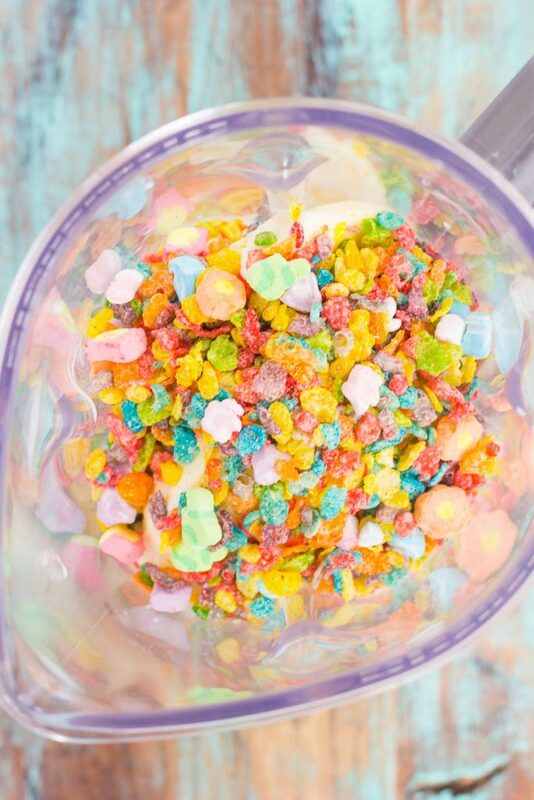 In the canister of a blender, add the ice cream, milk, vanilla extract, and Marshmallow Fruity Pebbles. Blend until reaches your desired consistency. Pour into two tall glasses and top with three marshmallows per glass. Lightly toast the tops of marshmallows with a kitchen blowtorch. Like what you see? Then be sure to head to your nearest Walmart to buy a box of Marshmallow Fruity Pebbles! Okay, confession: I still take those vitamins. In fact, I took more when I was pregnant, since I couldn't swallow those huge prenatal vitamins and my doc said the kids' version was all good. This milkshake is crazy impressive. I can't believe how creative it is! Truly stupendous, Gayle! Ok, if you take those vitamins, then maybe I should start, too...I'm so curious to see if they still taste the same :) Thanks for the milkshake love, friend! I could live on Fruity Pebbles, no joke. They're the BEST!! Love this idea so much! Yes! It's so good! Thanks, Kathy! What a fun milkshake flavor! Love the toasted marshmallows on top! I loved watching the Flintstones growing up AND starting my day with Flintstone's vitamins and cereal! Fruity Pebbles were always the best (followed closely by cocoa). lol This shake is so fun...my kids would flip over this! Cocoa pebbles were so good, too! Thanks for the milkshake love, Marcie! Whoa, this shake is like a combo of fruity pebbles and lucky charms with a little s'mores goodness thrown in there- epic! Yes! Such a fun combo! Thanks, Medha! This looks like such a fun recipe, and I know my niece would love to make something like this. I haven't had Fruity Pebbles in the longest time! Too long, actually! I love this creative take on a childhood favorite! YUM! 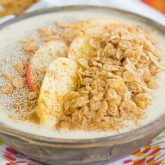 What a fun summer dessert! My kids would be out of their minds if I served them these! Lol! So pretty, too! Thanks for the milkshake love, Blair! Wow, what a fun and colorful milkshake! This is such a fun milkshake I can hardly even stand it, Gayle! I mean, what kid or kid-at-heart wouldn't go completely NUTS over this?? I can't even stop drooling right now and totally wishing this would appear in front of me! Haha yes! My mom used to give us the Flinstones vitamins when we were younger too and we always hoped she would get us Fruity Pebbles for breakfast instead of the boring ones. So I am totally loving this fun milkshake! It's so pretty and colorful, Gayle! Whoa!!! 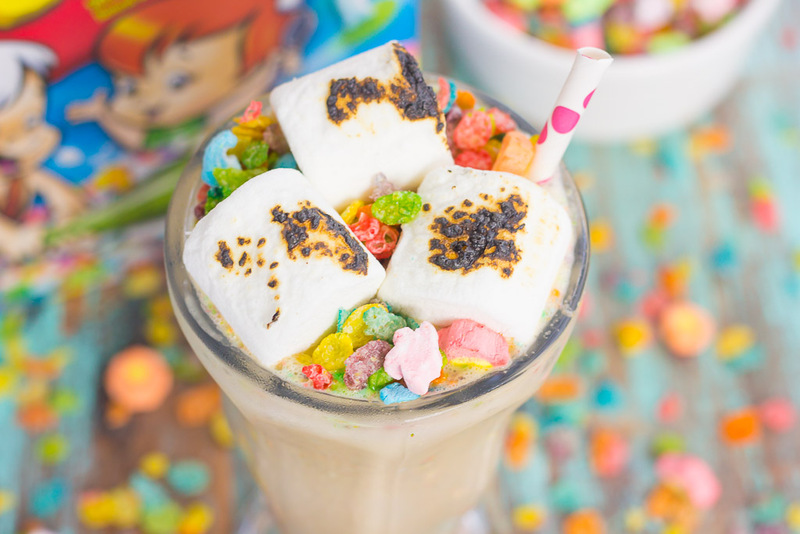 love this crazy fun Toasted Marshmallow Fruity Pebbles Milkshake!!!! it's taking me back! love the marshmallows on top! Thanks for the milkshake love, Alice! Oooh YES, please! 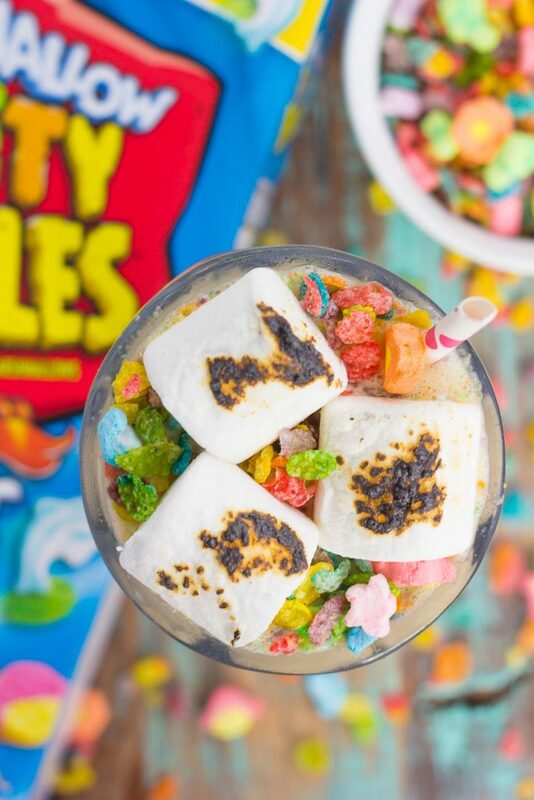 A big fruity pebble milkshake for me :D this looks SO good, and I loooove those big toasty marshmallows you added on top. Yum! This is such a fun milkshake Gayle, love it! Omg Gayle, I love marshmallows in my cereal and now in fruity pebbles!! I need to find some too! This milkshake looks so good! It's SO good, Ami! Thanks!